Download a light-weight yet powerful tool to help you implement Pomodoro Technique®. XorTime features a Pomodoro timer, a Todo list, an Activity Inventory and Stats capabilities to track your progress. The built-in Pomodoro timer will track the time you spend on your tasks and on your Projects. A simple method that boosts your productivity. Work other 25' followed by 5' break and so on. Every 4 sessions of 25' work take a longer break. Every interval of 25' is called 'Pomodoro'. Attempting to keep focused for a 25' session will train your brain to avoid distractions. XorTime is a work-out tool to strengthen concentration and improve your Productivity. See how you're performing throughout the month. As long as you practise the Pomodoro Technique you'll improve your concentration skills. The ability to focus is like a mental muscle. The more we work it out, the stronger it becomes. Keep track of what types of tasks you're working on. 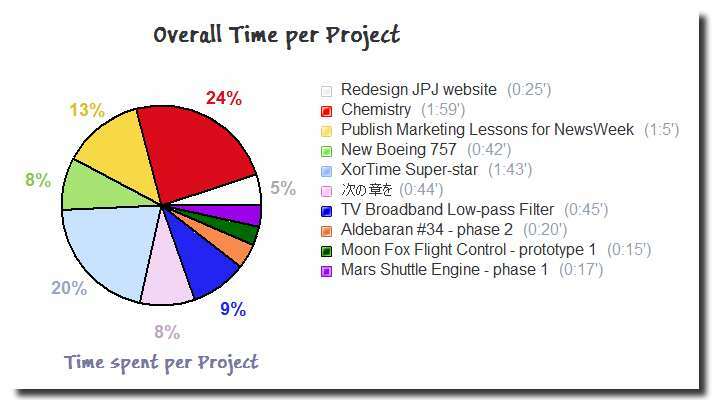 Define your projects, eg Learn Spanish, Design new web-site for JW Bank, Write book 'How to practise Yoga',..
See the amount of time you have spent on each. Install XorTime and try it out. Press the button to start the Pomodoro Timer. Engage not to interrupt yourself while the Pomodoro Timer is active. Could you spend all the 25 minutes on your Task? Congratulations! You've completed your first Pomodoro®. In any case, the Pomodoro timer will track the minutes spent on each Task. 4. Have a 5' break. you can set the Timer again and continue working on that. You may need more than 1 Pomodoro® to complete your Task. eNOugh TIME in the day..
Time is never enough, right? We rush all the day but quite often we feel like we haven't done enough. Always caught on (too) many activities and - who knows why - our list of outstanding things still grows up. The Pomodoro Technique® was invented by Francesco Cirillo. and daily activities. Download XorTime and try the Pomodoro Technique® right now!